Three years ago I reported on a modern dance ensemble from Lithuania that combined dance with the music of Depeche Mode at an EU event in Vilnius. Now for the second time a report from the work place on music. Everyone has his own dream. In this case it was to organise a party where this person could walk around like Elvis, pose like John Travolta and dance to Abba. For what it's worth it was total fun. With several male persons my age present, I had lived through the 70s listening to the albums of Pink Floyd, David Bowie, The Rolling Stones and the likes of (symphonic) rockers. On the other end of the spectrum were soul and later disco. Somewhere in between was Abba. Something told me that what this Swedish band produced was good. Most of its songs were to soft though or for whatever reason had a Greek sirtaki influence that was popular in the second half of the 70s, early 80s. Next to that it had some mighty disco rock hits and a few fabulous ballads. Then there were the two great looking women in the band. That did help a little, but there was no way for a late, male teen to admit that Abba was good or even contemplate the option. Abba was not for me. In 2016, 40 years after Abba's big break with the 'Arrival' album, two things have happened. It is easy to admit that Abba was The Beatles of the 70s, but time did the other thing. 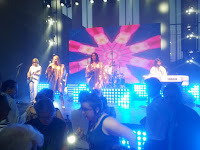 One is that Abba has become a part of my musical heritage, like the disco song played around the gig. There was not one song that I at least could not sing along a part of and some nearly complete. Memories of a time gone by. Two is that I know so much more about music and then it is easy to admit to the quality of the songs. They are hits. One thing has not changed though: I will never play Abba at home. If I want to play something of the 70s, it will be Pink Floyd any place, any time, any where. Going back to the EurID sponsored party at the EuroDIG, a European version of the Internet Governance Forum, under the motto "knowing me knowing you". Arriving in the huge venue, there was a stage with no amplifiers for the band, but none the less a professional looking outfit. No amplifiers?, I thought. A playback act with expensive looking gear? Disco music was setting the mood, great food was served and the 'Saturday Night Fever' dance floor was in place. 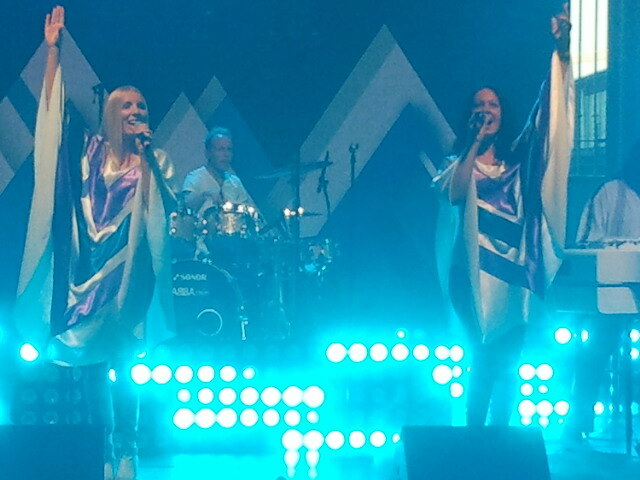 Abba Revisited is strange combination. It is an Abba dress up act. The guys wear wigs, the girls resemble the dark and blond and there is a drummer hidden a bit away in the background, who looked like Lars Ulrich of Metallica and we suspected that his head set was not for listening to what the band was doing but to set him apart from the Abba songs. The guitarist showed a fondness for 80s U.S. rock solos by the kind of Van Halen. 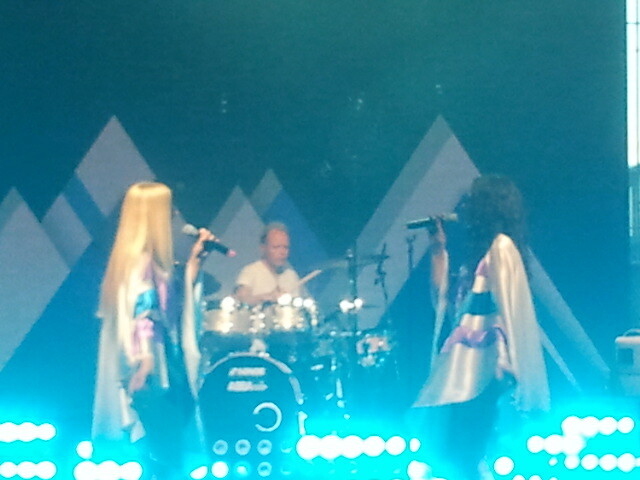 A bit weird for Abba? What this oomph to the music did, is give the louder songs of Abba a tremendous lift that brought them into the 10s and made them extremely danceable. In short more and more people flocked to the dance floor and yes, the youth present know the songs also. Abba may have been their mother's music of choice at the time. For U.S. citizens present things were different. Abba? Who's that? Although several sounds did seem to come from electronics and not from what was played, what was played, was played very well and the two girls can sing. The Abba harmonies all came out in a beautiful way. From the moment my favourite Abba's disco songs, 'Gimme Gimme Gimme, came along, I stopped thinking about it and submerged. Abba Revisited had me. In the roughly same life span as The Beatles, 8 years, Abba produced a shear endless number of hits. Abba Revisited played a lot, but by far not all, also excluding the theme song of the evening, one of my personal favourites. The girls changed dresses twice during the show. The last one for the finale. What other song than the band's biggest hit 'Dancing Queen'. It still has not left my mind. 'Waterloo', the song that broke the band in 1974, winning the European Songfestival, was revisited as the final encore. By then all present loving music, singing and dancing had been pushed over. Including this and a few other rock fan(s). People of EuroDIG and EURid. Thank you for a great party.